Many thanks to Ben in Hiroshima for today's post on buying a house in Japan. Ben is a new home owner and shared his buying experience in this exclusive AccessJ interview. So you've got a job, a car, maybe you're even married, and you're thinking about taking another step forward in planting your roots in Japan: Buying a house to live in. House shopping will open up all kinds of questions: Do you want a マンション atop a 45-floor building or your own (perhaps tiny) plot of land to call home? What's your budget? Who will be living in the home? What silly neighborhood watch programs and trash disposal schedules are you willing to put up with? 1) First off, how much does buying a modest house cost? What kind of down payment is needed? Firstly, as a foreigner even if you have the entire amount of money in cash to pay for the property and the home right there, the seller may still say "no." Let's get that part out of the way. Some banks still don't want to take a risk with foreigners. If you work for a large company like Toyota or Mazda and you have forms provided from your employer, they can help you get approval from the bank. Because the developer has the land and the banks and agents make the deals, it is ultimately up to the bank to accept or decline your application. Additionally, if you really want to be approved, expect to provide between 2.5 and 5.0 million yen as a down payment. If you don't have a sizable down payment, the odds are stacked against you. You may need to borrow from family to make one, which can put strain on your marriage if your family is not supportive of your relationship. There are a variety of cultural concerns involved in asking financial assistance from family to secure a loan. So, know how much money you need and consider whether you want to proceed from there. That amount can be an instant roadblock for many. 2) What kind of documentation does the buyer have to provide? As a foreigner, there is a variety of documentation regarding visas and city approval forms that need to be created and signed. Additionally, if you have a family, all city documents and bills must be in order before you can receive copies of them to submit with the application to buy. Some city offices may ask you to first complete the forms through them, then once they're completed inform the bank directly. If you buy through an agent, he or she will be able to tell you what documents to provide in your particular case and municipality. 3) What about a guarantor--is that stuff no longer necessary since you're purchasing? A guarantor is an absolute must. You can not and will not get a home without one. As usual, choosing a guarantor is tricky; they need to be of a certain age and still qualify financially. A guarantor who is a government employee will make things much easier. Your Japanese wife won't do as a guarantor, and if you don't know anyone else, you may have to ask her mother or father. Additionally, keep in mind that this is a co-sign situation: although the guarantor is signing for you, you are also signing for them, as they have a claim on your property. Be careful and choose someone you trust. 4) Did you use a bank loan? If so, how hard was it to apply and get approved for it? Getting approved for a bank loan is difficult. Many will not approve a foreigner. SMBC is one bank said to approve loans to foreigners with Japanese spouses. When applying, you need to prove that you don't plan on leaving Japan--ever (or at least until the loan is paid off). Having a family and a full-time, non-contract job is one helpful indicator that you intend to stay. As usual, speaking good Japanese oils the process and improves your chances. If you don't understand enough Japanese to get through the initial prescreening interviews, they probably won't accept your application. Banks claim that foreign loan applicants often try to get out of their contract when they belatedly learn something about that contract which they didn't understand clearly when applying, and that because of this, foreigners cause too much trouble to do business with. If you are applying with a large, out-of-area bank, you may be asked to travel to a larger city to meet the bank's representative. It can be a troublesome, but may be required. If traveling is difficult in your case, talk to the bank about sending a representative to visit you at home. 5) How much were you able to haggle on the price? You can only haggle with the developer. How much you can drag the price down really depends on the particular house you're buying. Some homes may be newly made but sit on the market for 2 years without a buyer. The seller might reduce the price and re-list the property, then be unwilling to reduce the price any further. Or, if the house is new and in a good location, the seller may not care to haggle because he thinks someone will pay asking price. I haggled and was able to cut 2 million yen off the price of the home. Again, language skills are key here. 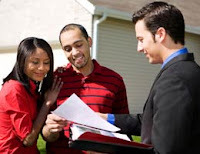 6) How do you register the property for taxes? Does the agent take care of that? You register for property taxes at the city office. After buying, you'll be going there anyway to change your residence address and whatever else the city office wants you do every time you move. There will be a lot of obnoxious forms, but the bureaucracy needs them to function, so get over it and fill them out. In our case, the guarantor had to be listed as a resident of the house, so his registered address changed and we began receiving his mail. This kind of thing can be a real pain. The agent does take care of many financial documents--if they're good. If they aren't good, you will have lots of trouble, so in fact, you'll want to shop around for a good agent before you shop for a house. A good agent is a time saver, as he or she will make sure the process goes smoothly and be a wealth of knowledge for you, ready to answer any questions you have. You'll pay taxes immediately on the property, so be prepared to see a lot of money disappear really quick. Also, don't be late paying on the acquisition. That is a sign to the bank that you are not fulfilling your obligations, and they may charge you a fee for the delay. Thanks again, Ben, for sharing your experience! Stay tuned for more articles on living in Japan over the next few weeks!